Located near the modern day village of Geyre, Turkey, Aphrodisias was a small ancient Greek city in the ancient Greek region of Caria. 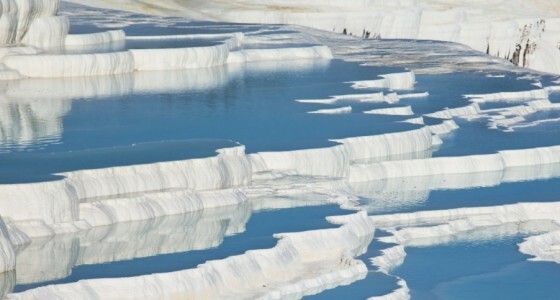 It is approximately 100km from the village of Pamukkale, and most visitors use this as a base from which to visit Aphrodisias, although it is also easily done as a daytrip from Kusadasi or Selcuk. If you love classical ruins, then a trip to Aphrodisias should be on your agenda for your visit to the Pamukkale or Ephesus area. The trip to Aphrodisias is worth it just to see the picturesque setting of this site which is situated among fertile fields. The ruins of Aphrodisias were “re-discovered” in 1958 by Turkish photographer Ara Guler who was forced to spend the night in Geyre on his way home from a photo shoot after becoming lost. When he woke up and looked around the village he was stunned to see marble everywhere and statues embedded in walls of buildings. He explorered the village with the help of local children, and took photos to document his find and sent them to a number of archaeologists, including a Turkish archaeologist, Professor Kenan Erim, based at Princeton University. Professor Erim hopped on the next flight to Turkey, and so the excavations and relocation of Gyre to a site 2km away began. 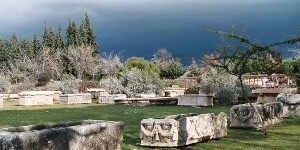 Professor Erim dedicated the next 30 years of his life to uncovering the story of Aphrodisias, and is now buried there. It is thanks to his work that visitors today can enjoy this wonderful site. Famous for its sanctuary of Aphrodite, the city’s patron goddess, and home to a reknowned school of marble sculpture, Aphrodisias was a very prosperous city from the first century BC to the sixth century AD. Because so much of the city was made from marble there are many monuments and artifacts that remain intact today. In particular, the Temple of Aphrodite formed the nucleus of the city. 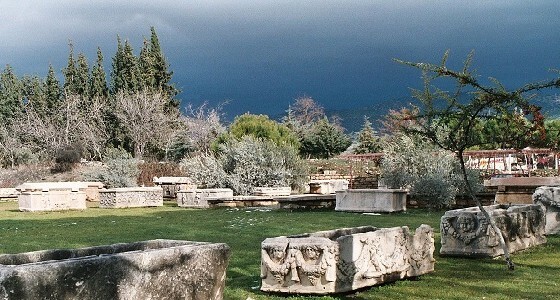 It is believed that Aphrodisias was inhabited as far back as the sixth or fifth millennium BC, although it was fairly small at that time. Coins and inscriptions bearing the name of the city date back to the second century BC, suggesting tha this was the time when the city really started to flourish and become prosperous. Aphrodisias was personally protected by the emperor Augustus from late in the first century BC, and this continued to the city’s prosperity. It became the capital of Caria in the third century, and from the fourth century was the seat of a Christian Bishop. IN the fifth century, the Temple of Aphrodite was reconstructed as a Christian basilica. 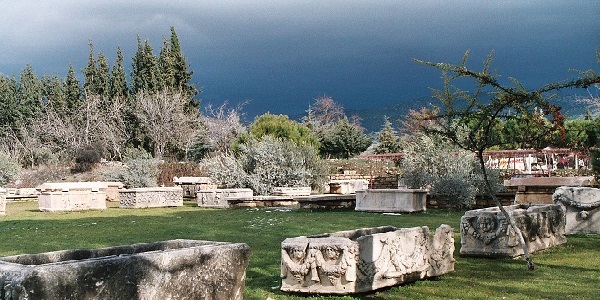 Because so much of the city has been preserved, and because of its marble culture, Aphrodisias gives us many clues about aspects of Greek city life under the Roman Empire. In particular, the stadium in Aphrodisias is one of the best preserved in the region, and for many visitors, seeing it is a highlight of their trip. It has a capacity of 30,000 and was designed particularly for athletic contests. It was also used for festivals, circuses and games. Standing in the stadium it is easy to imagine the crowds cheering and shouting. Over time, raids, religious disputes, political and economic pressures, and a number of epidemics and earthquakes saw the city decline. There is little information about the city after the 7th Century, but it is believed that the town had a short revival in the 11th century as a result of it being taken over by the Seljuk Turks. Aphrodisias was attacked by the Turko-Mongol ruler Tamerlane in 1402, and following this, the town was completely abandoned.